Those who have passed away are remembered through the creation of wonderful offerings; a mix of nostalgia and happiness where the altar is a metaphor for life, leading the souls of the dead to the reunion. 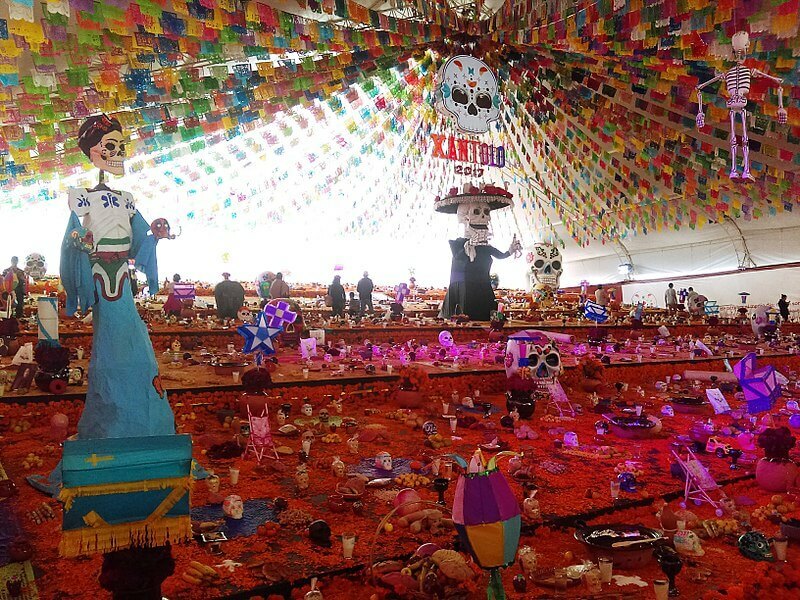 Photographs, favorite objects, the typical Pan de Muertos (Bread of the Dead), the unique Mexican marigold flower, skulls made of sugar and chocolate, typical dishes, candles, and a myriad of ornaments add a special touch to these altars during the celebrations. Of course the big city gets dressed up to celebrate this holiday with its grand Parade down the Paseo de la Reforma and the Great Offering of Zócalo in the historic center. On the first days of November, cultural, artistic and touristic events revolve around the most deeply rooted Mexican tradition recognized worldwide. Furthermore, there are various displays and wonderful altars for the dead all around the city in institutions, universities, city halls, museums, burial places and cultural spaces. 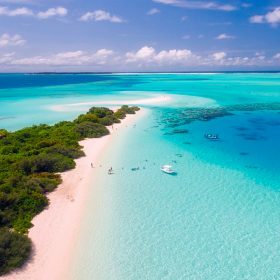 This is one of the most recognized places to see these traditions in action, starting on 28 October and going until the beginning of November. Thanks to its natural beauty, unique architecture and huge lake, Patzcuaro offers a wonderful experience during this period. 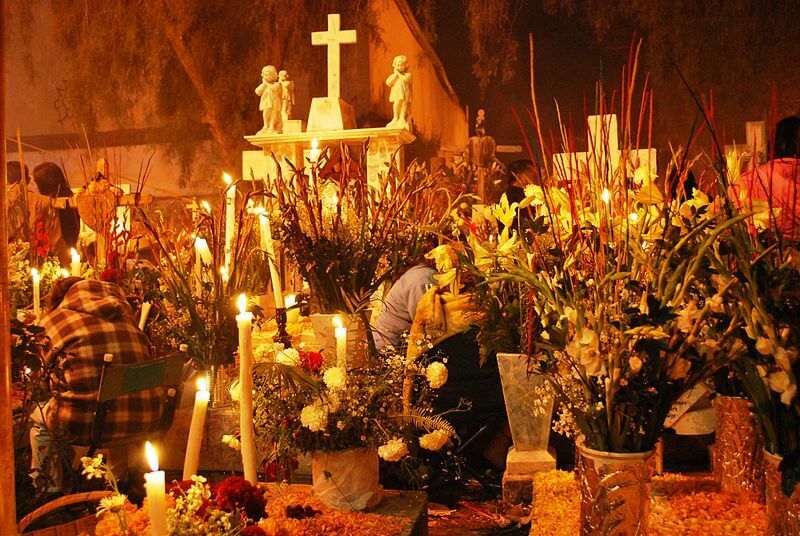 The community holds processions to the Tzurumutaro cemetery, located on the tip of the island of Janitzio, in which everyone walks silently towards their reunion with the deceased, bringing them their favorite food, flowers, drinks and music. The candle-lit fishermen’s rafts, radiating light across the lake in the area, is a true spectacle. Imagine navigating the Xochimilco canals in traditional trajinera boats, but in the middle of the night. Riding in the candle-lit trajineras is quite the experience, as you observe the altars set up on the edge of the canals, accompanied by up-beat music in the background. During this period, the story of La Llorona (a classic Mexican legend) is recreated, making the ride even more special. The traditional Festival of the Dead is celebrated on the first days of November, in which you can see offerings for famous or local deceased figures, as well as businesses and the facades of houses decorated with the Day of the Dead theme. Of course the famous Calaveras Catrina, or “Dapper Skeletons”, make their way through the main square so that all can appreciate their beauty. There are also wonderful art exhibitions centered on theme of death, calavera literary competitions, local cuisine and many more cultural activities on offer. This is undoubtedly one of the most typical celebrations for this period in Mexico. Its inhabitants have such a deep-rooted celebration that everyone comes together in the San Andrés Mixquic cemetery to reunite with the dead. Every year both locals and tourists alike visit the area to view the spectacle; wonderful offerings, literary calaveritas competitions, a catrina creating contest, a parade of the dead and a great folk festival take over Mixquic during the Day of the Dead celebrations. 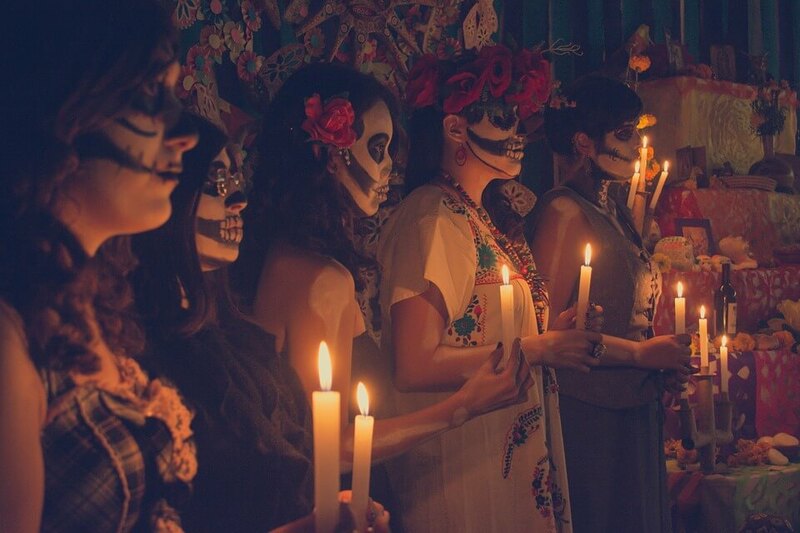 One of the most beautiful states in all of Mexico where the Day of the Dead celebrations bring the customs, architecture and local cuisine together with the smell of candles, incense and Mexican marigold flowers. The great attraction, besides the beautiful altars, are the colorful rugs created using natural pigments by its inhabitants to capture this wonderful, unique tradition that is recognized around the world. The colorful altars in its main square, as well as in the houses, hotels and local businesses on the surrounding streets, are the main tourist attraction when visiting San Miguel during this period. 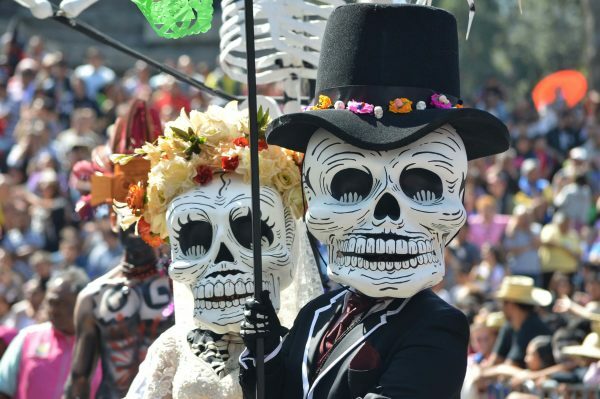 The parade of Calaveras Catrina, the squash sculpture exhibit and the wonderful Festival of Calaca are just some of the events held on the first days of November, which you will undoubtedly enjoy. 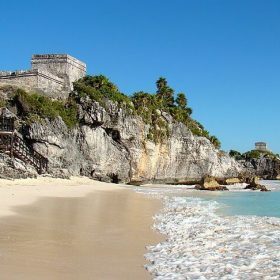 This idyllic beach destination also pays tribute to the dead with the Festival of Life and Death Traditions held in the Xcaret Park, attracting thousands of tourists. In addition, you can see traditional offerings throughout the area, as well as theatrical and dance performances, concerts, interactive workshops and much more. This event celebrates the spirits coming to meet their loved ones, later lighting the way for their return to the afterlife with thousands of candles. One of the most beautiful colonial states in Mexico celebrates this wonderful tradition to the fullest. 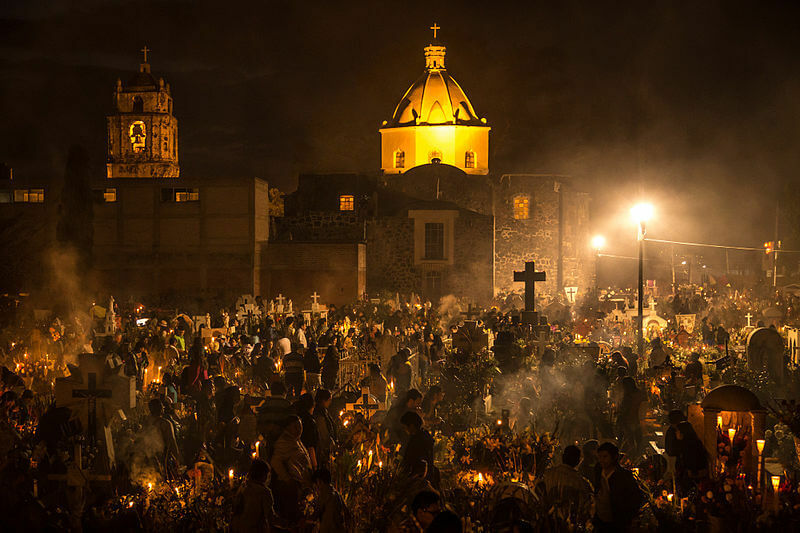 All of the historic center’s squares are filled with colorful altars complete with Mexican marigold flowers, candles, food, drinks and the festival’s typical decorations, such as perforated paper and sugar calaveras. This joyful festival also offers artistic and cultural activities for the whole family, where the folklore of the Day of the Dead will captivate you. This is a magical town in the state of Puebla, and is considered to be one of the oldest towns in the Americas. The Day of the Dead festival is celebrated with the Parade of Calaveras Catrina in the main square around the offerings. 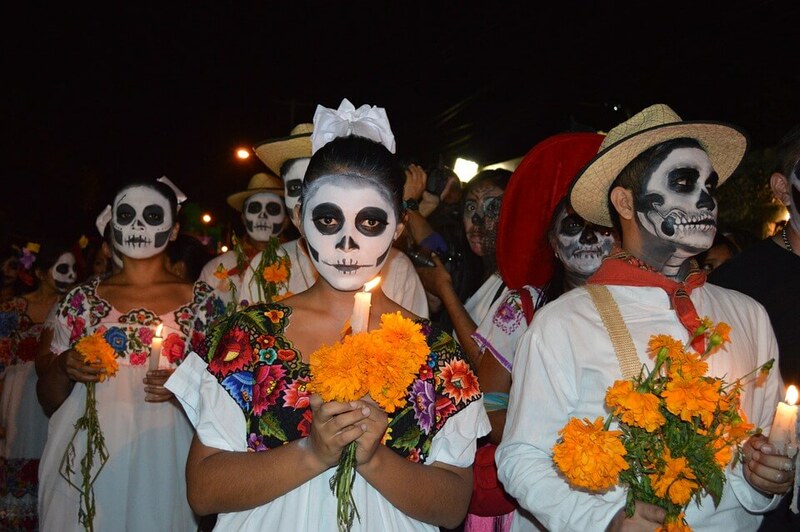 It also hosts the Catrina Festival, where well-known artists and bands honor the deceased through music. In addition, the area’s cemeteries are beautifully decorated because death, although a reason to be sad, can also be joyful as our most beloved family and friends are honored. We invite you to experience this wonderful Mexican tradition by visiting any of the mentioned destinations. 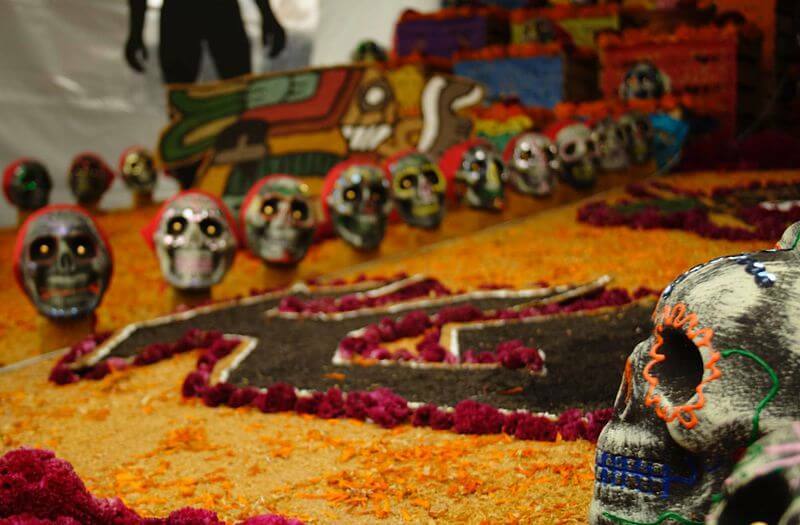 We’re sure you will find the Day of the Dead, a unique celebration in the world, truly fascinating!